When it comes to impressive vehicles that bring a lot to the table for an affordable price, the Jeep Compass is currently one of the front runners here at DARCARS Chrysler Dodge Jeep RAM of Rockville. We recommend this vehicle often to our customers and with good reason. The exterior is very durable and sporty, but on the inside, this is where the magic is. There has been a lot of thought put into the interior of the Jeep Compass. It has become the perfect, all around vehicle used as a commuter vehicle, an off-roading champion or an adventure companion. Standard, the Jeep Compass comes with a seven-inch display as part of the driver information digital cluster display. You can upgrade to a larger screen that is touch screen if you would like. You also have a dual pane sunroof that makes your view and experience even better. 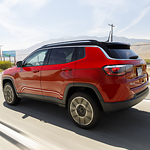 If you are interested in finding out more about the Jeep Compass, stop down to DARCARS Chrysler Dodge Jeep RAM of Rockville today to find out more.